1. Add chocolate chips to prepared waffle mix. 2. Make waffles in Oster® Waffle Maker. 3. Separate waffles into triangles. 4. 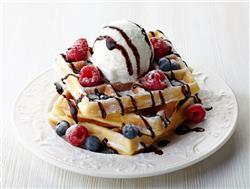 In a serving plate drizzle syrups in a design and then layer waffles with whip cream three waffles high. 5. Take fourth waffle triangle and stand up in plate. Use some whip cream to help it stay straight if needed. 6. Add small scoop of ice cream to plate in front of standing waffle. 7. Sprinkle fresh berries around plate and serve.